The front panel of my Valve EchoTapper with rotary encoder (on stripboard) and four push-button switches. The Up and Down buttons could actually be left out. The Adafruit LCD Shield kit which is used in my automation project is supplied with pcb mounting tactile switches but they are too short to protrude through the front panel with the lcd mounted in the enclosure. Switches with extra-long actuators can be purchased to replace them but I have concerns about the long-term reliability of these little tactile switches so I opted to replace them with off-board panel mounted switches when I built my Valve EchoTapper. A couple of builders have asked for the details of how to wire them to the LCD Shield so I’ve prepared a document to show how I’ve done it. Click here to download the instructions as a pdf file. 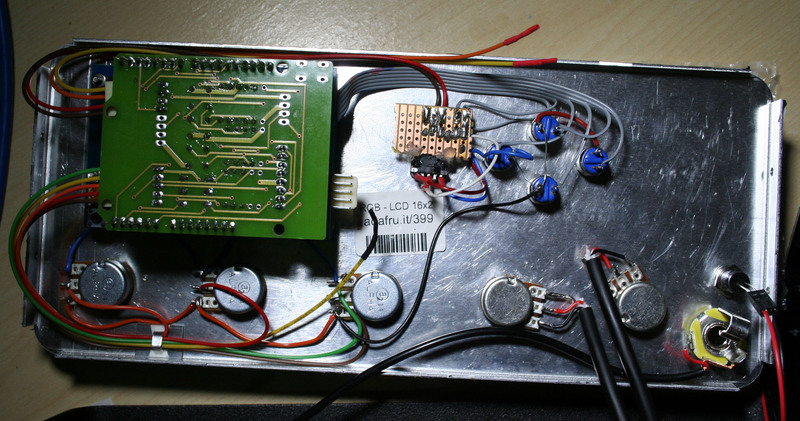 This entry was posted in How To ..., Wiring Guide and tagged Building Instructions, rotary encoder, switches, wiring on January 31, 2014 by guitarphil. I’ve personally found that adding a simple rotary encoder to the EchoTapper makes selecting and editing patches a whole lot faster and more user friendly. The Automation firmware has supported the use of such an encoder for some time but I have been remiss in not documenting how it is connected. Before I delve into the details let me explain what the rotary control does in the EchoTapper with Automation. It basically replaces the up, down and select buttons so you can simplify your control panel to just a knob for the rotary encoder (which acts as Up, Down and, by pressing the knob, Select) and two buttons, Mem and Edit. 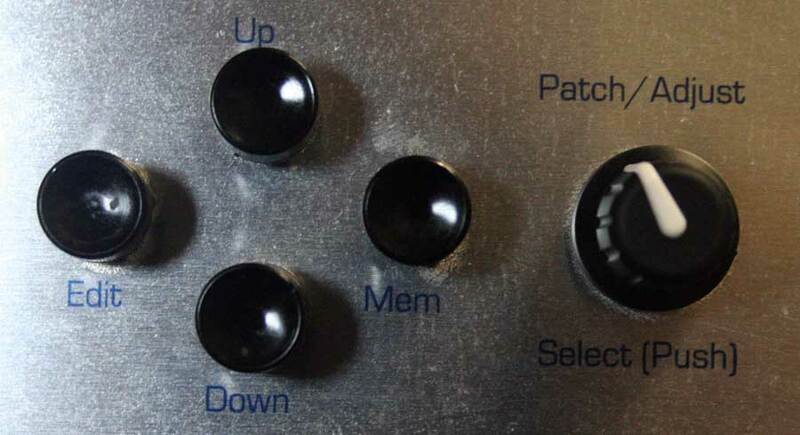 I recommend labelling the encoder knob Patch/Adjust and Select (Push) as in this photo. You’ll notice that I have retained the Up and Down buttons (and these still work but you can omit them) and turning the Patch/Adjust knob clockwise and anticlockwise will act as ‘up’ and ‘down’ respectively. Pushing the knob acts as the ‘Select’ button. Turn to flick through presets and User patches. In Basic Editor mode, turn to adjust the ‘Prog’, ‘Wet/Dry’ and ‘Feedback’ values of the patch. In Manual mode, turn to change the echo model. In Advanced Editor mode, turn to change the echo model then Press to select it for the patch you are editing. When editing the patch name (Advanced Editor) turn to change the current letter and press to advance to the next character position. So how do you wire it up then? I’ve covered this in detail in a document which you can download here. This entry was posted in Hardware, How To ..., Wiring Guide and tagged arduino UNO R3, echotapper, rotary encoder on January 30, 2014 by guitarphil. This is a minor improvement to the Automation firmware (software) for the Arduino in your EchoTapper. Taking up a useful suggestion from my Finnish friend Rolf Holmberg, I have changed the number range displayed for the Mix, Program and Feedback knobs, when editing a patch in either the Basic Editor or Advanced Editor modes.. Previously the values were displayed using a range of 0-255 but now the values are shown in a 0-100 range. This should make it a little easier to ‘translate’ from a patch setting to a knob position on a non-automated eTap2HW and vice versa. For example if someone says “I set Feedback to 3.5 for that tune” you can use a value of 35 when setting up a similar patch. This entry was posted in Download, Firmware, Updates and tagged Automation, number range, Rolf Holmberg on January 30, 2014 by guitarphil. Thanks to Rolf and Steve for testing Librarian on Windows XP and Windows 7. We discovered a problem in that if there was only a single enabled COM port on the user’s computer the Librarian failed to connect to the attached EchoTapper. This has been resolved in the latest Version 2.50 of the Librarian and we can confirm that it works on Win XP and Win 7. Click here to download the Windows (32 bit) Librarian version 2.50. The package should be unzipped to any convenient location on your computer where you will then find a folder called application.windows32. Open this and double click the .exe file to run the Librarian. If the Librarian only detects a single active COM port when it starts it will attempt to connect to it. If this is your Arduino then it will reset the Arduino and contact will be established. You can hit the EchoTapper’s Down button (or turn the encoder CCW) during the Welcome message or just wait and hit the Librarian’s Get Patches button to transfer patches from the Arduino to the Librarian. If the Arduino is connected when you start the Librarian and you have more than one COM port, the Librarian will not attempt to make contact as it won’t know which COM port it should use. In this case you must select the correct COM port yourself from the Drop down list and this will initiate contact with the EchoTapper and you can then proceed as before. This entry was posted in Download, Software, Updates and tagged Librarian, Software, Update on January 24, 2014 by guitarphil.